U.S. #3369 pictures a Saturday Evening Post cover from 1937. On December 31, 1903, Times Square hosted its first-ever New Year’s Eve Celebration. The history of New York’s New Year’s Eve celebration is closely tied to newspaper publisher Adolph Ochs and the New York Times. For over a century, New Yorkers and visitors have rung in the New Year together at the New York Times Building. 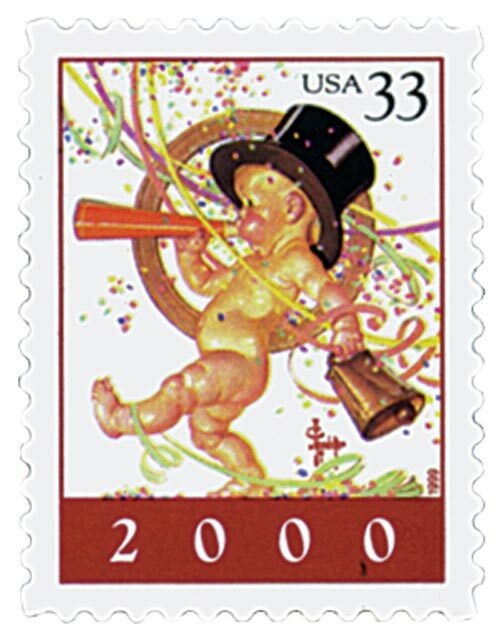 U.S. #2720 – America’s first Chinese New Year stamp, issued on this day in 1992. 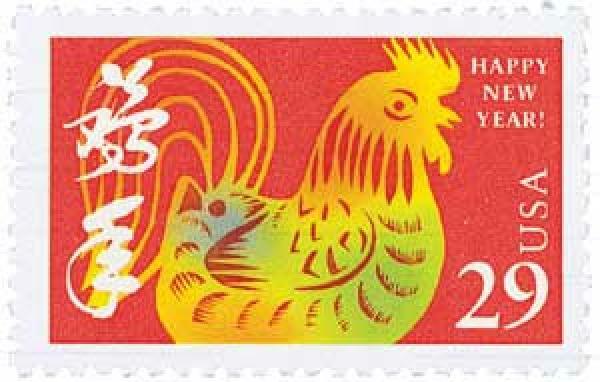 On December 30, 1992, the USPS issued its first Chinese New Year stamp, honoring the start of the Year of the Rooster. 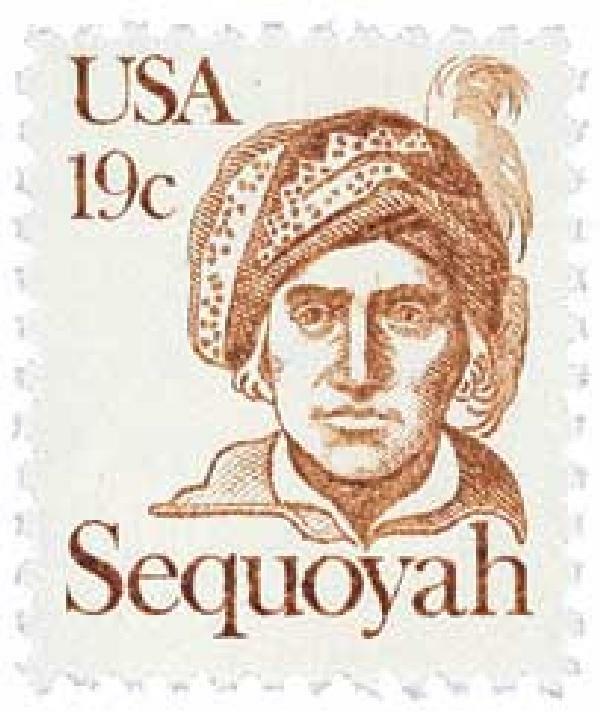 The issue of this stamp was in part inspired by repeated requests for stamps to honor additional holidays – New Year’s, Easter, the Fourth of July, and Thanksgiving. There had also been calls for stamps honoring the signs of the Zodiac. There had also been several groups calling for stamps to recognize the contributions of Asian Americans, while the USPS wanted to explore topics to appeal to younger Asian American collectors. U.S. #348 was issued on this day in 1908. 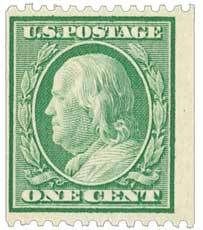 On December 29, 1908, the US Post Office Department issued its first coil stamps on a national scale. Earlier that year, the Post Office experimented with coil stamps but only made them available in five cities. The experiment ended after a representative from the Post Office Department successfully “broke into” the vending machines used to sell the stamps. 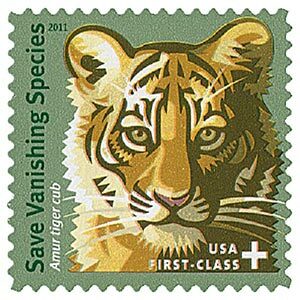 U.S. #B4 – US semi-postal that raised funds for Wildlife Without Borders. On December 28, 1973, President Richard Nixon signed the Endangered Species Act into law in an effort to protect threatened species from extinction. Throughout the late 1800s and early 1900s, people around the globe grew increasingly concerned about the plight of animals nearing extinction. As the bison neared extinction and the passenger pigeon disappeared, people began calling for wildlife conservation. Proponents of the conservation movement introduced the larger American public to the idea of extinction. U.S. #1859 was issued on this day in 1980. On December 27, 1980, the USPS issued the first stamp in the Great Americans Series, which would go on to become the longest-running US definitive series. The Great Americans Series was created to replace the Americana Series, which had begun in 1975. The new series would be characterized by a standard Definitive size, simple design, and monochromatic colors. 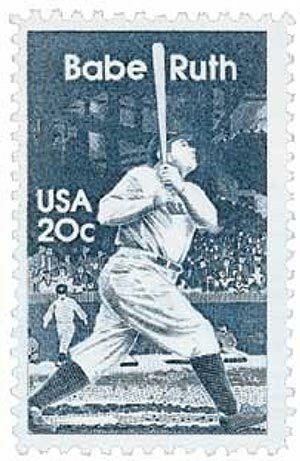 U.S. #2046 was issued for the 50th anniversary of the All-Star Game. On December 26, 1919, Babe Ruth was sold to the New York Yankees, ushering in the long-standing superstitious Curse of the Bambino. Born in 1895, George Herman “Babe” Ruth – sometimes called “the Bambino” – was one of the most popular and talented players in baseball history. He began his career as a pitcher for the Boston Red Sox, but longed to play every day.